306 pages | 31 B/W Illus. Elite youth sport competitions have increased significantly in number in recent years, with the Youth Olympic Games representing the high point of this phenomenon. This book examines the global context within which elite youth sport has emerged and continues to grow. It explores elite youth sport policy across fifteen countries, in Europe, the Americas, Africa and Asia, addressing the questions of how youth talent development is organised and why elite youth sport has become so popular. Taking a comparative global perspective, the book analyses the growth in more systematic approaches to young athlete development and the increasing emphasis on early talent identification. It discusses the attitude of stakeholders (such as NGBs, governments and sponsors) towards elite youth sport, while also considering how young elite athletes’ interests are protected and how the growth in elite youth sport affects a sport’s development strategy. 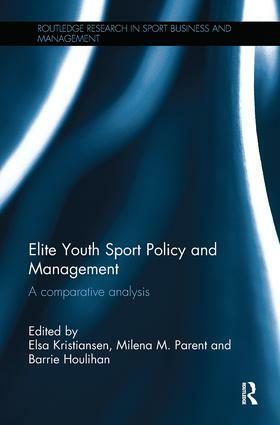 Written by a team of internationally renowned researchers, Elite Youth Sport Policy and Management: A comparative analysis is fascinating reading for all students, scholars, managers, policy-makers and coaches with an interest in youth sport, elite sport development, talent identification and sports policy. Elsa Kristiansen is Associate Professor at the University College of Southeast Norway and Visiting Professor at the Norwegian School of Sport Science. She has published over 40 articles and book chapters, the majority of which are in the areas of sport psychology (e.g. motivation, coping with organisational issues and media stress, coping with youth competitions) and sport event management (e.g. volunteerism, Youth Olympic Games, stakeholders involved in talent development). Milena M. Parent is Associate Professor of sport management at the University of Ottawa and at the Norwegian School of Sport Sciences. Her expertise lies in sport event management and some recent publications include the Routledge Handbook of Sports Event Management (with J.-L. Chappelet, Routledge, 2015), The Youth Olympic Games (with D.V. Hanstad and B. Houlihan, Routledge, 2014), and Managing Major Sports Events: Theory and practice (with S. Smith-Swan, Routledge, 2013). Barrie Houlihan is Professor of Sport Policy at Loughborough University, UK and Visiting Professor at the Norwegian School of Sport Sciences. He has authored or edited 20 books and authored over 60 journal articles. His most recent book is Managing Elite Sport Systems: Research and practice (edited with Svein S. Andersen and Lars Tore Ronglan, published by Routledge). He was the founding editor of the International Journal of Sport Policy and Politics.